Brain Injury Australia continues its pursuit of the four recommendations of its report into Australia’s first research into family violence and brain injury, funded by the Victorian Department of Health and Human Services, and launched in May by 2015’s Australian of the Year – Rosie Batty, pictured above – in front of 250 people at Melbourne Town Hall. (Video of May 1st’s launch is available to view via Brain Injury Australia’s YouTube channel YouTube channel. 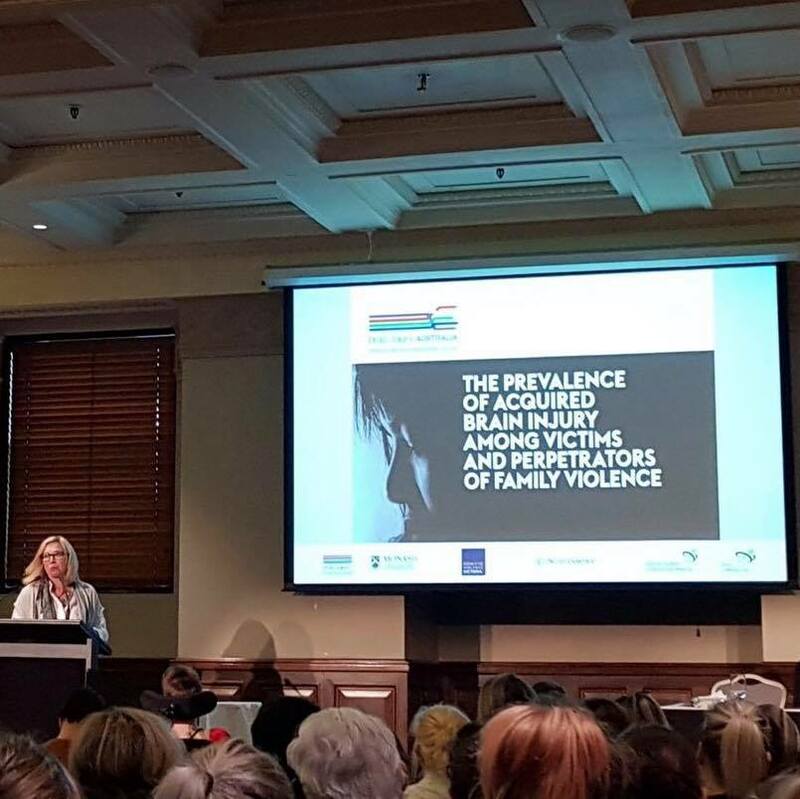 The research’s key findings: 2 in every 5 of the 16,000 victims of family violence attending Victorian hospitals over a decade had sustained a brain injury; nearly 1 in every 3 of the victims of family violence were children, and, of those, 1 in every 4 had sustained a brain injury. Brain Injury Australia is actively seeking partners and funders/ funding for pursuit of its report’s four recommendations, including: the development and distribution of information resources on brain injury; the addition of screening questions for brain injury in family violence risk assessments; the mapping, or development of, services and supports for both victim-survivors of family violence with a brain injury as well as those at increased risk of perpetrating of family violence as a result of their brain injury; and the piloting of an integrated brain injury and family violence service. If you have any ideas or suggestions, I look forward to hearing from you. You can download a PDF of the report, here. Brain Injury Australia is gaining traction on the recognition of brain injuries the result of family violence. Its submission to Family Safety Victoria for the recognition of traumatic brain injury in the Multi-Agency Risk Assessment and Management (MARAM) framework was successful. Screening questions for traumatic brain injury – alongside for hypoxic-anoxic brain injury due to strangulation and choking – have been included in both the follow-up of Queensland Police Service’s Vulnerable Persons and Domestic Violence Unit and in intake for the Sydney Women’s Counselling Centre, which “provides prevention, early intervention, therapeutic treatment and support for maintenance of long term recovery for clients with complex co-occurring mental health, addiction and trauma presentations through short, medium and long term counselling”. Brain Injury Australia is also working with: the Brain Injury Rehabilitation Service at Westmead Hospital and family violence services in the Western Sydney Local Heath District on a six-month pilot project commencing in early 2019, focussed on identification of brain injuries the result of family violence, referral pathways and specialist education and training across services; and with Melbourne’s The Bouverie Centre – a Victoria Family Institute service combining clinical family therapy, academic teaching, qualitative and quantitative research, workforce development and community education – in funding for a pilot of an integrated brain injury and family violence service. Brain Injury Australia’s Executive Officer, Nick Rushworth, appeared alongside long-standing friend and colleague of Brain Injury Australia, Rebecca Gentz – a victim-survivor of family violence – in a video produced by NSW Health’s Education Centre Against Violence for The Country Rugby League of New South Wales’s Tackling Domestic Violence Program.